What Are the Symptoms and Signs of Ovarian Cancer? What Are the Causes and Risk Factors for Ovarian Cancer? What Are the Exams and Tests for Ovarian Cancer? What Is the Follow-up for Ovarian Cancer? What Is the Prognosis for Ovarian Cancer? Cancer occurs when cells undergo a change called a malignant transformation. They begin to grow and multiply without normal controls. As the cells grow and multiply, they form masses called malignant tumors or cancerous frowths or just cancers. A cancer can also spread or metastasize from their site of origin into the other tissues. Cancer is dangerous both because of its local growth and the damage it can cause and its potential for spread. Cancer growths overwhelm healthy cells by taking their space and the oxygen and nutrients they need to survive and function. Ovarian cancer occurs when a tumor forms in one or both of a woman's ovaries. The ovaries are a pair of small organs that produce and release ova, or human eggs. The ovaries also produce important hormones such as estrogen and progesterone. They are located in the lower abdomen (pelvis), on either side of the womb (uterus). Ova released by the ovaries travel through the fallopian tubes to the uterus, where they may or may not be fertilized by the male sperm. Not all transformations or changes are "bad" or malignant. A benign transformation can produce tumors. Benign tumors can grow in place, but do not have the potential to spread. The ovaries can develop benign tumors, as well as malignant tumors or cancers. In the process called metastasis, malignant tumors may encroach on and invade neighboring organs or lymph nodes, or they may enter the bloodstream and spread to remote organs such as the liver or lungs. The presence of metastases or metastatic tumors is an ominous finding noted in the more advanced stages of cancer of the ovary. The type of cell that originated the abnormal growth determines the class of the ovarian tumors. Epithelial tumors: These tumors arise from a layer of cells that line the ovary called the germinal epithelium. A majority of all ovarian cancers are epithelial. These are most common in women who have been through menopause (aged 45-70 years). These epithelial tumors are rarely found without at least some evidence of spread. Chemotherapy is used in addition to surgery to treat these cancers. Stromal tumors: Stromal tumors develop from connective-tissue cells that help form the structure of the ovary and produce hormones. Usually, only one ovary is involved. These account for 5-10% of ovarian cancers. These tumors typically occur in women aged 40-60 years. Often, surgical removal of the tumor is the only treatment needed. If the tumor has spread, though, the woman needs chemotherapy. Germ cell tumors: Tumors that arise from germ cells (cells that produce the egg) account for about 15% of all ovarian cancers. These tumors develop most often in young women (including teenaged girls). Although 90% of women with this type of cancer are successfully treated, many become permanently infertile. Metastatic tumors: Only 5% of ovarian cancers have spread from other sites to the ovary. The most common sites from which they spread are the colon, breast, stomach, and pancreas. Within these main classes are many different subtypes of tumors. Noncancerous (benign) ovarian masses include abscesses or infections, fibroids, cysts, polycystic ovaries, endometriosis-related masses, ectopic pregnancies, and others. Of markedly enlarged ovarian masses (>4 cm) found in women who are still menstruating (have not been through menopause), about 20% are cancerous. Of markedly enlarged masses found in women who have been through menopause, about 45%-50% are cancerous. The incidence of ovarian cancer varies greatly. Globally, Scandinavia, Israel, and North America have the highest rates. Developing countries and Japan have the lowest rates. Some 14,240 women in the U.S. die each year from ovarian cancer. The five-year survival rate is greater than 75% if diagnosis of the cancer occurs before it has spread to other organs. However, the five-year survival rate drops to 20% when the cancer has spread to the upper abdomen. In the United States, about one in 56 women develops cancer of the ovary. About 22,280 new cases in the U.S. are diagnosed each year. Ovarian cancer is difficult to diagnose because symptoms often do not occur until late in the disease. Symptoms do not occur until the tumor has grown large enough to apply pressure to other organs in the abdomen, or until the cancer has spread to remote organs. The symptoms are nonspecific, meaning they could be due to many different conditions. Cancer is not usually the first thing considered in a woman having symptoms. In most ovarian cancer cases, no identifiable cause is present; however, family history does play a role. The lifetime risk for U.S. women of developing ovarian cancer is low. If one first-degree relative -- a mother, sister, or daughter -- has the disease, the risk increases. The risk can climb to 50% if two first-degree relatives have the disease. If a woman has ovarian cancer and her daughter develops ovarian cancer, the daughter will probably develop the cancer at a relatively young age (younger than 60 years). Ovarian cancer has been linked with three hereditary syndromes. Breast-ovarian cancer syndrome: A mutation in a gene called BRCA1 has been linked to increased risk of both breast and ovarian cancer. Some women who have this mutation develop ovarian cancer. Another mutation, involving the BRCA2 gene, also increases the risk of ovarian cancer but to a lesser degree. These mutations are hereditary, meaning that they can be passed from one generation to the next. Clues that may indicate the presence of these mutations include family members who have ovarian cancer or breast cancer (especially those who are diagnosed with these cancers when younger than 50 years), a relative with both breast and ovarian cancer, or a male relative with breast cancer. Development of more precise estimates of cancer risk and better genetic testing for carriers of these genes is taking place. Hereditary nonpolyposis colorectal cancer (HNPCC) syndrome (Lynch syndrome II): This genetic syndrome has been dubbed "family cancer syndrome" and is associated with colon cancer developing in people younger than 50 years. Other organs that can be involved include the uterus, ovary, breast, stomach, and pancreas. A mutated gene causes this syndrome. Women with this syndrome have a chance of developing ovarian cancer. Site-specific ovarian cancer syndrome: This is the least common of the three syndromes and experts don't know much about it, yet. This syndrome may be due to mutations of the BRCA1 gene. Use of fertility drugs: Some studies have shown that the use of fertility drugs increases the risk of ovarian cancer, but study results have not been consistent. European (white) heritage: White women are much more likely to have ovarian cancer than African American women. Some findings suggest that estrogen may promote ovarian cancer in women who have been through menopause. For years, the cancer risks involved with using hormone replacement therapy divided the medical community. Research findings in 2002 and early 2003 showed that hormone replacement therapy does not provide many of the benefits it was believed to have, and it increases the risk of heart disease. Experts no longer routinely recommend long-term hormone replacement therapy for most women, though the issue can be considered on a case by case basis. Some factors decrease ovarian cancer risk. Any factor that inhibits ovulation (release of an egg from the ovary) seems to protect against development of ovarian cancer. This may be because ovulation disrupts the epithelial layer of the ovary. As cells divide to repair the damage, uncontrolled division and malignant changes may occur. Term pregnancy (lasting the full nine months) significantly reduces the risk of ovarian cancer. As the number of pregnancies increases, the risk of ovarian cancer decreases. Use of oral contraceptives (birth control pills) reduces the risk of ovarian cancer. Breastfeeding lowers risk of ovarian cancer, and the risk decreases with increasing duration of breastfeeding. Removal of the ovaries before cancer reduces the risk of cancer arising in the ovaries to zero. However, cases of a closely related condition called primary peritoneal carcinoma due to embryonic remnants of ovarian formation can still occur. This may be a consideration in women with inherited cancer risks. Experts should base this decision on genetic testing and counseling. Having the woman's "tubes tied" (tubal ligation) to prevent pregnancy. Having a hysterectomy lowers the risk of ovarian cancer. If experiencing abdominal pain, distension, or bloating that is not explained by simple constipation, lactose intolerance, or another harmless condition, the woman should see her health care provider right away. In fact, if she is older than 40 years or has a family history of breast or ovarian cancer, these symptoms should be attributed to constipation or other conditions only after her health care provider has ruled out the possibility of ovarian cancer. Many exams and tests are used to determine if a woman has ovarian cancer. Physical exam: Every woman should have an annual pelvic exam in which the health care provider feels (palpates) the ovaries. Ovaries are normally small, especially in women who have been through menopause, and are deep within the pelvis. Normal-sized ovaries are difficult to feel. Because of this, the pelvic exam is not very effective in detecting early ovarian cancer. Masses large enough to be felt may represent advanced disease. More often, they are harmless growths or other noncancerous conditions. Ultrasound: If a mass is present, the health care provider may recommend an ultrasound examination to find out what kind of mass it is. Ultrasound imaging can detect small masses and can distinguish whether a mass is solid or fluid filled (cystic). A solid mass or complex mass (having both cystic and solid components) may be cancerous. Incorporating Doppler technology to identify certain patterns associated with tumors seems to improve the usefulness of ultrasound screenings. If the ultrasound shows a solid or complex mass, the next step is to obtain a sample of the mass to see whether it is a cancerous tumor. Many studies have reviewed the value of ultrasound screenings for ovarian cancer of women who have no symptoms. Although ultrasound identified many masses, very few of these masses (about one in 1,000) were cancerous. Furthermore, many women underwent unnecessary surgeries only to discover benign masses. CT (computed tomography) scanning: If ultrasound reveals a solid or complex mass, a CT scan of the pelvis may be done. A CT scan is a type of X-ray that shows much greater detail in 3 dimensions. A CT scan provides more information about the size and extent of the tumor. It can also show whether the tumor has spread to other organs in the pelvis. The health care provider also conducts lab tests to gather information about the woman's medical condition and to detect substances released into the blood by ovarian cancers (tumor markers). The health care provider may request a pregnancy test if there is any chance the woman could be pregnant. Pregnancy can be detected by checking the blood level of beta-HCG, a hormone that increases dramatically during pregnancy. Ovarian masses during pregnancy may be associated with ectopic pregnancies (pregnancy outside the womb) or may be normal structures that produce other hormones important in gestation. The woman's blood will probably also be checked for tumor markers. Health care providers suspicious that ovarian cancer is present usually conduct the CA-125 test. The level of the most widely studied tumor marker, CA-125, is elevated in more than 80% of women with advanced ovarian cancer and in about 50% of women with early ovarian cancer. The level of this marker value can be affected by a number of factors, including age, menstrual status, and conditions such as endometriosis, pregnancy, liver disease, and congestive heart failure. Cancers of the breast, pancreas, colon, and lung also secrete the CA-125 marker. Because this marker can be influenced by so many factors that have nothing to do with ovarian cancer, this marker is not used for routine screening of women who have no symptoms. Healthcare professionals do not recommend genetic screening for women with no first-degree relative, or only one relative, with ovarian cancer. Women with two or more relatives with breast or ovarian cancer should be referred to a medical genetics specialist to discuss genetic testing. Members of families with hereditary nonpolyposis colon cancer (HNPCC or Lynch syndrome II) should also be referred to a specialist. Ovarian cancer is diagnosed by taking a sample of the tumor (biopsy). The tumor material is examined by a pathologist, a physician who specializes in diagnosing diseases by looking at the cells under a microscope. There are several ways to collect a biopsy of an ovarian mass. If the mass is small, it may be possible to remove the entire mass during laparoscopy. Usually, the surgeon removes the entire ovary. If the mass is larger than 2.75 inches (complex cystic and solid mass) or 3.5 inches (solid mass) on ultrasound, removal will probably require conventional or open surgery. This procedure, called exploratory laparotomy, involves making a larger incision in the skin and abdominal muscles to gain access to the pelvic region. If the biopsy finding is positive for cancer, further staging procedures will be performed. Staging is a system of classifying tumors by size, location, and extent of spread, local and remote. Staging is an important part of treatment planning, because tumors respond best to different treatments at different stages. Staging is also a good indicator of prognosis. Staging usually requires imaging studies, lab tests, and exploratory laparotomy. Ovarian cancers are classified in stages I through IV. Stages I, II, and III are further described by the letters A, B, or C depending on the location of the tumor, the presence of metastasis, and other factors. Stage IV cancer is not subdivided. Stage I: The cancer is confined to one (IA) or both (IB) ovaries. The tumor may be on the surface of the ovaries, or ascites may be present (IC). Stage II: Cancer is found outside the ovary (pelvic extension) and has spread to the uterus or fallopian tubes (IIA) or other areas in the pelvis (IIB). The tumor may involve the capsule of the ovary, or fluid in the abdomen may contain malignant cells (IIC). Stage III: Cancer has spread to pelvic organs and possibly to lymph nodes. Microscopic "seeds" of cancer are on abdominal peritoneal surfaces (IIIA), or small implants of tumor on abdominal peritoneal surfaces (IIIB). Abdominal implants may be larger or lymph nodes may be involved (IIIC). Stage IV: Cancer has spread to the abdominal organs (liver, spleen), or malignant cells are in the fluid surrounding the lungs, or are evident as metastases to the other organs outside of the abdomen and pelvis. Treatment of ovarian cancer should be under the direction of an experienced gynecologic oncologist (a specialist in women's cancers). For stage I tumors, only the involved ovary and fallopian tube may be removed for women who wish to become pregnant in the future. For women who do not wish to become pregnant, both ovaries, both fallopian tubes, and the uterus are removed. This is a hysterectomy with bilateral (two-sided) salpingo-oophorectomy. Usually this procedure removes the lymph nodes surrounding these organs and the omentum. If the tumor cell type is especially worrisome (grade 3 tumors and all stage IC tumors), chemotherapy is usually given as well. Stage II cancer treatment involves removal of the uterus, ovaries, and fallopian tubes, resection (partial removal) of any tumor in the pelvic area, and resection of any other structures affected with cancer. Chemotherapy is strongly recommended. The best treatment at this time involves a platinum-based agent (carboplatin) and paclitaxel (Taxol). These agents can be administered in six cycles of three weeks each. Other schedulers may also be used to administer these drugs. Stage III treatment is identical to stage II treatment, except more aggressive chemotherapy and possibly experimental treatments are given as part of a clinical trial. Some women may be candidates for direct abdominal treatment. This type of treatment is referred to as intraperitoneal therapy. This type of therapy is more difficult to take but may improve survival. Stage IV treatment involves extensive debulking and multi-agent chemotherapy. After chemotherapy is completed, the woman may undergo "second-look surgery." Her surgeon will examine her remaining pelvic and abdominal structures for evidence of residual cancer. Samples of fluid and tissues may be taken to check for residual cancer cells. A woman seen by her health care provider, in an emergency department, or in a clinic who is told that she may have a mass in her ovary should follow up immediately as recommended for more testing. Early detection of ovarian cancer is essential to ensure a better chance for long-term survival and good quality of life. 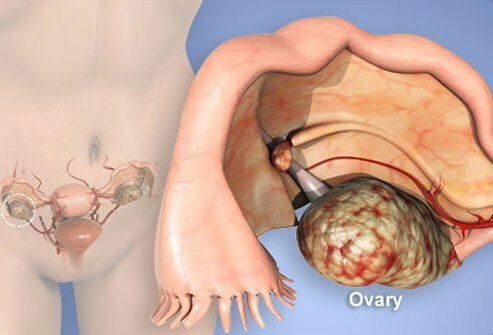 Following any type of surgery to remove an ovarian mass, detailed instructions on how to care for herself at home along with information regarding appropriate follow-up care are provided to the woman. If a woman was treated successfully for ovarian cancer, she will need regular physical examinations for the rest of her life and will likely be scheduled to have her CA-125 level checked every three to four months. Even if the ovaries and other pelvic organs are removed, residual cancer may go undetected. In order to identify recurrent cancer early, the health care provider should schedule regular visits, even if no symptoms are present. Any factor that prevents ovulation (the release of an egg) seems to decrease the risk of ovarian cancer. a woman has a strong family history of ovarian cancer or she knows that she has the BRCA1 gene mutation or HNPCC (Lynch syndrome II), she may want to talk to her health care provider about the possibility of having her ovaries removed after childbearing or after age 35-40 years. Many of the screening tests available for ovarian cancer do not detect early disease. In fact, the US Preventive Services Task Force does not recommend routine screening because there is no evidence that screening reduces the severity of illness or number of deaths due to ovarian cancer. By itself, each single testing method is imperfect. When used together, however, these tests may contribute to earlier diagnosis. The graph represents the 5-year survival rate for each stage of ovarian cancer. The percentage of survivors is divided by stage subtype (A, B, or C), except for stage IV, which is not divided. These data are from the International Federation for Gynecology and Obstetrics (FIGO), which publishes a report of treatment results submitted from around the world for a variety of cancers affecting women. The graph represents the 5-year survival rate for each stage of ovarian cancer. The percentage of survivors is divided by stage subtype (A, B, or C), except for stage IV, which is not divided. These data are from the International Federation for Gynecology and Obstetrics (FIGO), which publishes a report of treatment results submitted from around the world for a variety of cancers affecting women. Click to view larger image. "Epithelial carcinoma of the ovary, fallopian tube, and peritoneum: Clinical features and diagnosis"
How was your ovarian cancer diagnosed? Please describe your experience with ovarian cancer. What stage was your ovarian cancer when it was diagnosed? What is the prognosis for your ovarian cancer?